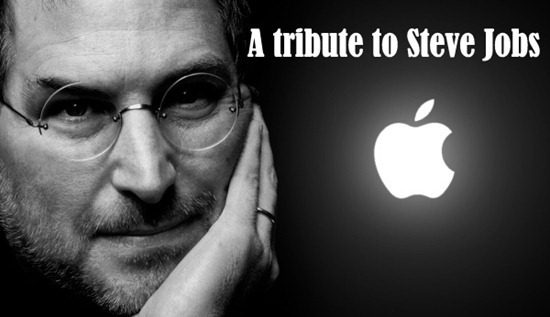 A Tribute to Steve Jobs on his Birthday! “Time is never right for your ideas; you have to make it right”. Steve Jobs truly exemplified the Silicon Valley entrepreneur. Steve Jobs, who lived 56 years of his life doing what he loved, turned a garage based computer venture into the most-valued company by market value. His life was tumultuous since his birth when he was born to unwed couple, put up for adoption, dropped out of college, having a baby from an unwed woman, getting fired from a company he himself started, fighting with companies copying his innovations, getting diagnosed with cancer and finally dying at an young age. Steve’s early experience with LSD drug is believed to have been the reason for his uncanny knack and his altered thinking process. He had no formal technical education, nor any real business experience, still he succeeded. It was only because he appreciated technology’s elegance and believed that computers could be more than hobbyist’s toys or corporation’s workhouse. This belief gave IBM a run-for-its-money. Steve flaunted beltless blue denim and black turtle-neck t-shirt in public appearances. He was meticulous when it came to product details, fastidious in picking people who would work with him, stealthy when it came to his private life and his innovations, relentless when it came to making things happen on time and perfectionist when it came to presentations and product launches. Jobs’ first product was the Apple I – a computer without a case, keyboard or monitor. Then Apple II arrived – the first mass-market product by Apple and one of the first successful personal computers. Jobs always believed that computers are not just for engineers, enthusiasts, or corporations. The product was a hit and it got Jobs featured on Time magazine’s cover page. Jobs then came up with Lisa with GUI, icons, windows and mouse – a failure due to exorbitant price. Macintosh was the first commercially successful PC to have GUI. Life took a turn and Steve Jobs was fired from Apple. He then started NeXT and Pixar Inc. He persuaded Apple’s then CEO to acquire NeXT and appoint him as the Chief Adviser. This was his return to Apple and then he never looked back. He launched iTunes that made buying music a simple process. He went on to launch world’s highest selling devices like iMacs, iPods, iPhones, and iPads. Pixar was sold to Walt Disney. Success is not what you think you’ve achieved, it is what people believe they have achieved because of you. Apple’s products gave new lives to 6 different industries – personal computing, animated movies, music phones, tablet computing, digital publishing and gaming industry – not to mention the countless software development firms that thrive because of Apple. Jobs’ penchant for perfection and genius revolutionized the way people communicate. His products also had a deep impact on the automobile industry as iPods superseded the CDs. Steve Jobs was an enigma, the more you tried to understand him, the more you got lost. He was a normal guy with a normal house and an open doorway. He did not like the ostentatious display of his wealth. He obscured away from his fight with pancreatic cancer. Even with more than 40 interviews with Jobs, Walter Isaacson, who wrote the biography “Steve Jobs”, was oblivious of some facts about Steve Jobs. Jobs was fine with the freewheeling hacker culture yet all his products were made under complete secrecy. Hiding his innovations was as important to Steve as was launching the product. Jobs’ favourite car Mercedes Benz SL55 AMG Silver had license plate without number. Isaacson couldn’t know the reason for this. me, he is the Chief Esthetic Officer at Apple who consistently delivered cutting-edge products with simple and elegant designs. Touted as one of the finest commencement speeches ever delivered, Steve Jobs narrated three stories of his life at Stanford University in 2005. The first story was about connecting the dots. A college drop-out, Steve stayed in the college without taking any classes and instead returned empty coke bottles to earn a living. Dropping out was one of the best decisions he ever made as that gave him the time and liberty to learn calligraphy that would later get imbued in designing the typography in Macintosh computer. The second story was about love and loss. Jobs was fired from the company he himself started and then he went on to start two companies named NeXT and Pixar, that created world’s first computer animated feature film, Toy Story. He fell in love with a girl named Laurene who later became his wife. He always loved what he did and never settled till he found what he really loved to do. His third story was about death. Steve was diagnosed with pancreatic cancer and had a biopsy. He later had the surgery to cure cancer. He believed that death is the destination that we all share and no one has ever escaped it. He was a genius in the disguise of a salesman, who not only sold his products but compelled people to work for him. Perhaps, the best sales line ever made in the history of mankind was when he recruited John Sculley, then President of PepsiCo, to be the CEO of Apple Inc.
“Three Apples changed the world, 1st one seduced Eve, 2nd fell on Newton and the third was offered to the World half-bitten by Steve Jobs”. Steve Jobs was certainly a quintessential tech geek who understood technology and considered it as the only means that can let us touch people we might not otherwise. He was an enchanting orator during the launch of Apple products and a peevish wailer when things didn’t go his way. Embarking on a new journey to heaven, he uttered “Oh wow. Oh wow. Oh wow.” These were Steve Jobs’ last words. We also wish for all our reader this “Wow” moment every time they do something innovative, because this is what defined this legend. Steve Jobs was indeed brilliant in his life and works, and without doubt, will be remembered every year on the same lines as this tribute published here. However, while heaping praise on Apple’s visionary long after his death, let’s not forget the ill-treatment of the workers at Foxconn who make it possible for us to possess Apple’s stunning gadgets. Some of them don’t even get to see the finished products!